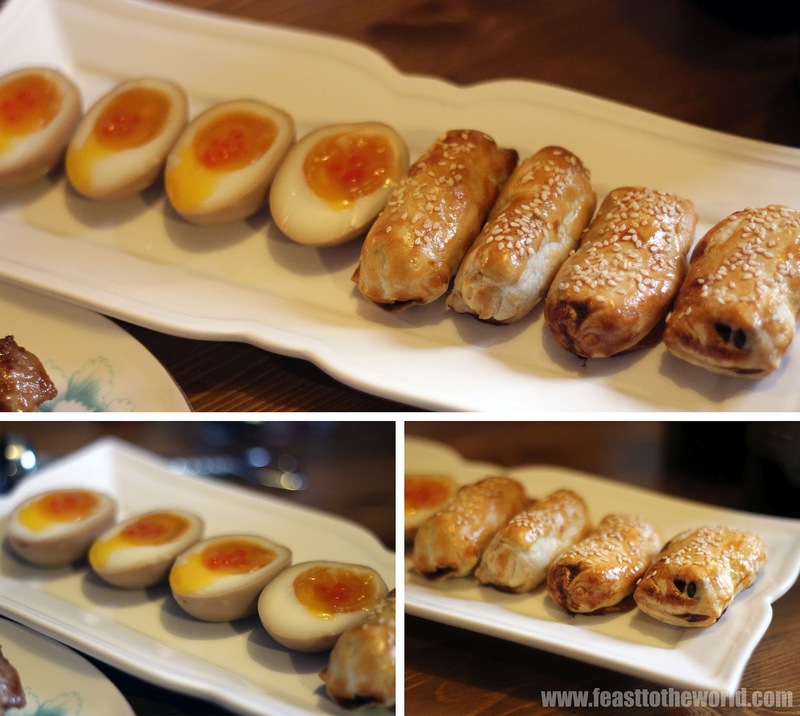 FedByTang supper club, the brainchild of the lovely Cherry of Feed the Tang promises to introduce a new Cantonese dining experience and to salvage the badly tarnished name of the so-called Cantonese cuisine that you get in a typical mundane Chinese restaurant around London. I was fortunate enough to be able to get my little greedy paws on a seat for her first ever supperclub date. Arriving on the evening with 7 other diners, we were welcomed by both the lovely Cherry and the Front-of-house on the night, the ever-amiable Shanghai sweetheart, Phoebe. A glass of aperitif in the form of fresh watermelon juice with shots of sparrow gin went down a treat amongst the diner and pretty soon, the silence were swapped with friendly chats. It wasn't long before we were led to the spacious dining room where a beautifully laid out dining table sit in the middle. Once settled down, the first dish were presented to use swiftly. 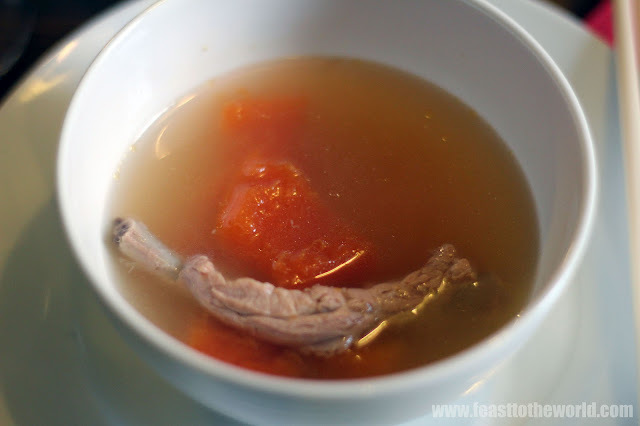 A childhood favourite of cherry - a papaya and pork rib soup, something her mum used to cook for her. The Soup were mildly sweetened with the fruity papaya and the pork gave it a good depth of meaty flavour. It was a rather comforting and warming soup. A good start to what promised to be a series of home comfort dishes bearing tales of childhood memories, always the best kind of food. Next up was the chicken wing morsels, looking deceptively simple, but with hidden surprise that must have taken ages to prepare. 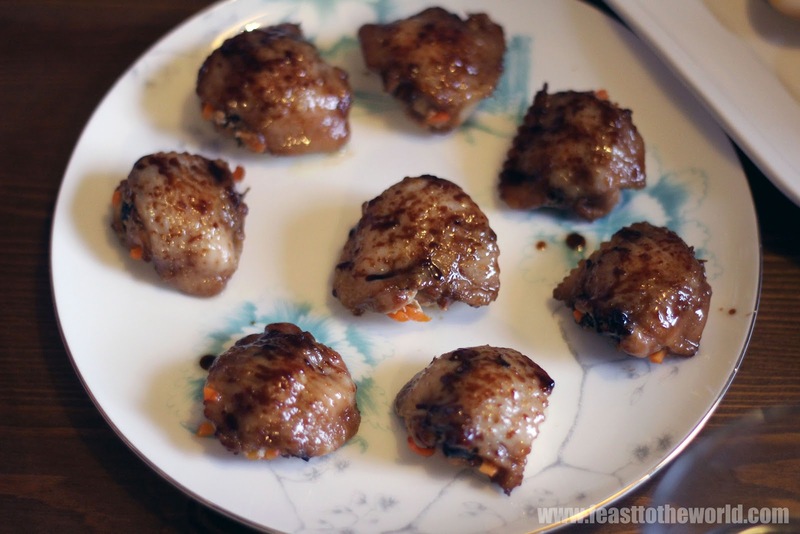 The wings were boned individually and then re-stuffed along with carrots and wood ear mushrooms to provide some interesting contrasting texture to the tasty bites. Along with these were the soft-boiled eggs that has been well-seasoned and top with salmon roe, it's fishy but works beautifully with the runny egg yolks, more like an accomplished take on the surf-and-turf. So moreish I could have eaten more of these. The pork puffs, like those you find in Dim Sum restaurant were just as delicious and the pastry were light and puffy, just as it should. 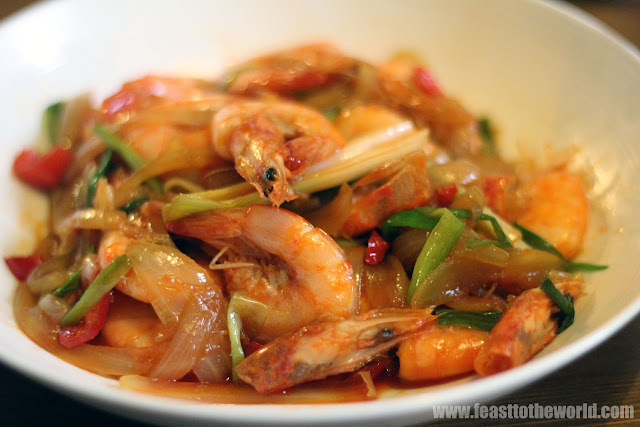 The spicy soy sauce fried prawns were up next, with heads, shells and all. And that's exactly how it would be eaten in a typical Chinese household. It's messy finger food - the twisting of the head; sucking of the sweet juicy heads and then eating prawns itself; finished off with cleaning the saucy fingers with my mouth. Yes, it was that finger-licking good!! Rice were then introduced to the room for the mains, in individual decorative china bowls. And then came my most anticipated dish on the night - Mui Cho Kao Yuk or triple cooked Pork belly with preserved vegetables. 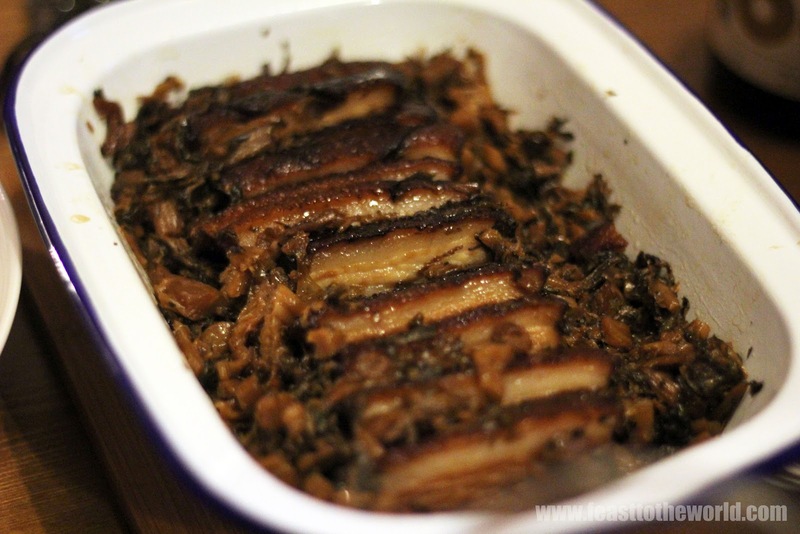 The pork belly has so much flavours that it not hard to see why it's the most popular cut in Chinese cuisine and when paired with the sweetness from the mui choi, this was in no doubt a superb dish and truly well worth the wait. Cleverly renamed Mouth-watering Chicken were infact known as 'Saliva Chicken' when translated from Cantonese but don't let the name fools you. This was absolutely delicious. The chicken were first blanched and then laden with a delectable piquant sauce made from sesame paste, sezchuan peppercorns and many more other flavours. It was perfumed and aromatic and the chicken were perfectly cooked and tender to the bite. The stir fried Kai Lan vegetables were beautifully cooked and the pan fried sea bass with Chinese garlic chive were so good I finished most of it. Then came the pudding in the form butter-free Swiss roll - light sponge evenly filled with cream and juicy raspberries that tasted as goo as it looks. Along with the cakes were a sundae glass filled with red beans, coconut ice cream, condensed milk and crushed ice - a glorified childhood favourite of cherry or as she put it, a 'posher' take on this humble pud. 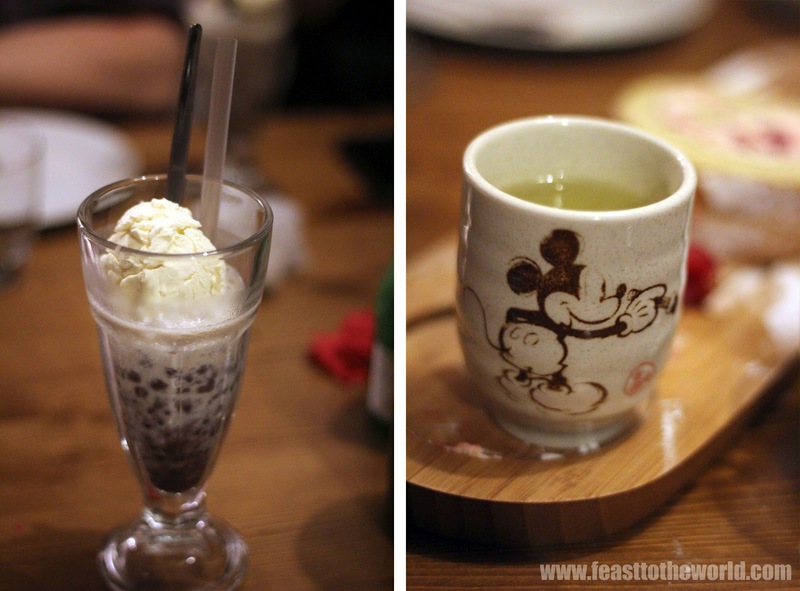 The whole evening ended with a nice cup of hot Chrysanthemum tea. Very light and was just the thing to ease my well-stuffed tummy. It was a delightful evening of authentic cantonese home cooked meal by the wonderfully talented Cherry, whose culinary skill was greatly showcased on the night.The night was also further enchanted by the amiable Phoebe too who was just a joy to talk to. 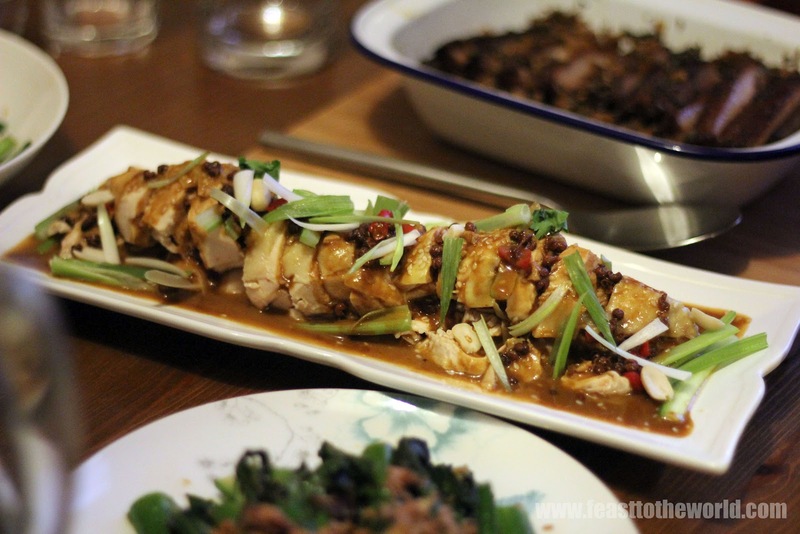 For more info on upcoming FedByTang supperclub date, click here for the link. wooohooO! amazing work by Cherry! small supper club too! Looks like you enjoyed yourself J! I want the saliva chicken!